Stephen Mandile, right, an Iraq War veteran from Uxbridge, Massachusetts, is the first to purchase recreational marijuana at the Cultivate dispensary on the first day of legal sales on Tuesday in Leicester, Massachusetts. 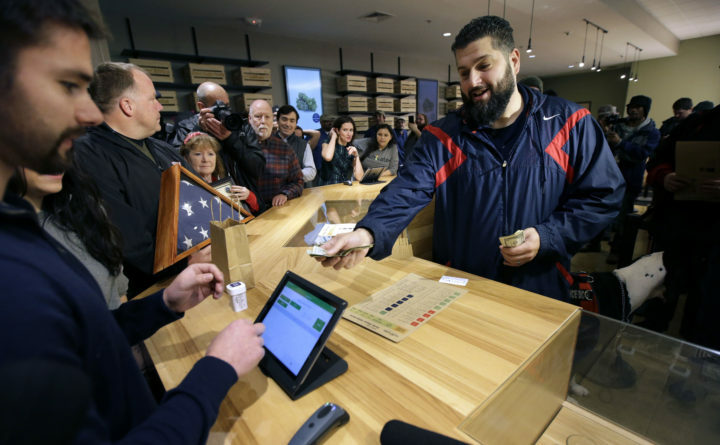 Cultivate is one of the first two shops permitted to sell recreational marijuana in the eastern United States, more than two years after Massachusetts voters approved it in 2016. LEICESTER, Massachusetts — More than two years after voters in Massachusetts approved of recreational marijuana for adults, there are finally places to buy it legally.